A coalition of freedom-loving patriots have organized a campaign that gun owners across the country should take part in. 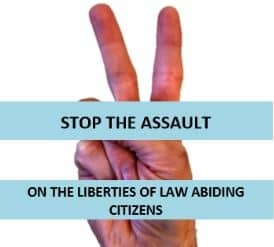 The “Stop the Assault” campaign is a national effort to urge Second Amendment supporters to mail very personalized, hand-written notes to their local, state and federal officials on February 1st, urging them to stand firm on the right to bear arms. 1. Find your elected officials — click here and then enter your zip code in the right column! 2. Download the “Stop the Assault” campaign letter and print copies for each official. 3. Fill out the spaces for your elected official’s name, your name, e-mail address, and any personal message that you might want to convey. Please keep your message concise and professional. Also fill out the “To” and “From” fields on the reserve side of the document. I urge you to reject all gun control — whether it’s Red Flag Gun Confiscation Orders or Universal Background Checks or semi-auto bans. Honest citizens should not have their rights stripped because of what a crazed killer might do. Please stop the assault on our liberties! 4. Fold the letter on the dotted lines, seal it with a piece of tape (do not staple), then affix a USPS “forever” rate first class stamp in the space provided. 5. Drop the letters in the mail on February 1st, 2019 on National Freedom Day! Again, please take part in this national campaign — our freedoms are worth standing up for! PS: Please contact your elected officials with the Stop the Assault campaign. And then please consider joining up with GOA — the no compromise gun lobby — to double your efforts!